WE'VE never been averse to making dopes of ourselves in the cause of a good yarn, so the spectacle of us being loaded into the back of a police car in Honolulu was somewhat par for the course. And a source of obvious bemusement amongst fellow hotel guests awaiting more normal means of transport. That was way back in 1990, and we were reminded of it recently when word leaked that Hollywood's CBS was to pilot a re-make of one of TV's most successful-ever police series, Hawaii Five-0. 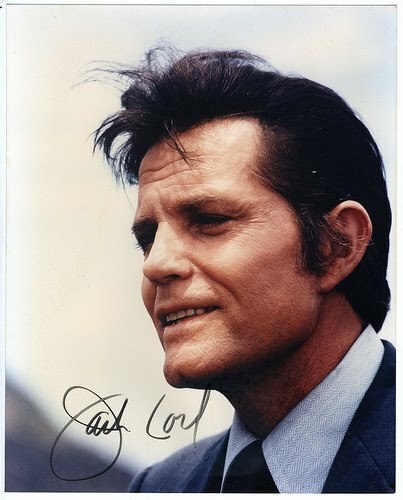 Our 1990 visit to Honolulu had been, amongst other yarns we were seeking, to search-out Jack Lord who'd played Steve McGarrett in Hawaii Five-0 for twelve years from 1968. And we need not have worried about any difficulty in finding him: unlike most former stars, he was openly listed in the Honolulu phone book. And he happily agreeing to an interview that very day – even suggesting we do it at his favourite Chinese restaurant, and offering to send his car around to save us having to catch a cab. So a couple of hours later we're standing with those other guests outside our Waikiki hotel, with no idea which the star's car may be amid the endless line of family autos, taxis and stretch-limos rolling-in to collect their human cargoes. This of course quickly becomes the focus of everyone's attention, including our own, particularly when an attractive lady in full police uniform steps out. And the more so when she enquires: "Anyone here Ellis?" Scarlet-faced we raise a limpid hand, and nervously croak: "I'm Ellis." "Please come with me," she says, opening the car's back door and ushering us aboard - now the focal point of a suddenly growing crowd of gawkers, each no doubt secretly appraising our potential demise. 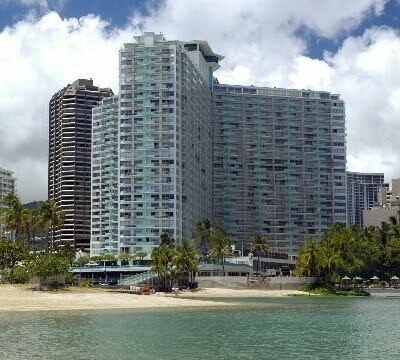 And along the way to Diamond Head where Jack Lord lives, the lady tells me that No, she's not really wearing a police uniform, it's a replica. And No, the "police car" is the last of several used by McGarrett in Hawaii Five-0, and allowed by the Governor of Hawaii to be used on the road by Lord after the TV series ended – a "Thank You" for the enormous publicity Five-0 had generated for Hawaii. Lunch proved rewarding, even if every question we put was interrupted by other diners seeking autographs. And never once did Jack Lord deny the 30, 40, 50 or more requests put to him, scribbling on paper napkins, pages from our dwindling notebook, and even on cigarette packets "Aloha (name of person) – Jack Lord." And what did we learn about Jack Lord the man, and Hawaii Five-0 the series? Firstly he admitted he'd got the star role of McGarrett by default. It had been offered to Gregory Peck who'd declined, and Lord was then invited to cast for it on a Wednesday, was told he had it two days later and was shooting the first episode in Honolulu the next Monday. "It was some week!" he recalled. 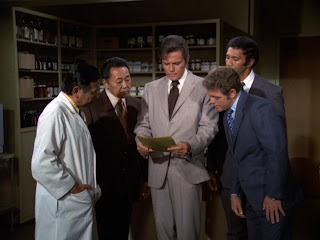 Others included mates of Jack Lord who did it for the fun of it – one, veteran Honolulu Police Officer Kam Fong, played one of McGarrett's team, Chin Ho for ten years between his real police duties. And Chin Ho, Lord told us, was named after another of his mates who owned the Ilikai Hotel on Waikiki – scene of each episode's opening shot in which a helicopter camera zooms-in on McGarrett on a top-floor balcony – while Wo Fat was named after a Chinese Restaurant in downtown Honolulu, and is still there today. Fast-forward now to 2009. CBS has engaged veteran writers Alex Kurtzman and Roberto Orci ("Transformers," "Mission Impossible III" and "Star Trek") to script the pilot for a potential new series of Hawaii Five-0, which will have McGarrett's son Chris succeeding his famous dad as head of the Hawaiian State Police. And, yes, if a new series goes ahead, it'll include McGarrett's now pop-cult catchphrase, "Book 'em Dano" with each episode's final scene arrest. IN his continuing search for the more weird, whacky and wondrous in the world of travel, David Ellis says the world's newest and largest cruise ship will give trivia buffs plenty to play with – and port authorities equally plenty to ponder over as they work out how to get more than 5000 passengers off and back on again in one day in ports of call. The 225,000 tonne Oasis of the Seas cost US$1.5 billion and a further US$75m was spent on revamping a pier at Fort Lauderdale in Florida for her exclusive use. She is nearly five times larger than the Titanic, 360m long (longer than three-and-a-half football fields,) 47m wide (greater than the distance between a Boeing 747's wing tips,) while her 20-storeys rise 72m above the waterline. And so she can get under bridges that would normally bar her way, her funnels retract telescopically into her interior. Oasis will normally carry 5400 passengers, but can carry as many as 6360, so if you don't want to run into someone for a second time, it will be easy enough to avoid them. She has 21 swimming pools and Jacuzzis and two artificial sand beaches complete with surfing simulators, an ice rink, two rock-climbing walls, basketball and volleyball courts, a real-grass chip and putt golf course and gardens with 97 varieties of living trees, shrubs and flowering plants. There's a boardwalk surrounded by restaurants and a 'fun park' with full-size carousel, and the whole ship is divided into seven "neighbourhoods," much like theme parks with various specific attractions in each. These include a mini, mini New York Central Park overlooked by dozens of the ship's cabins and staterooms, with zippy flying fox running over its full length. Six diesel engines generate 13,000 horsepower to drive the electric motors and provide power throughout the vessel – that's distributed via 5280-kilometres of electrical cabling and 100,000 power points. Ice-making machines can produce 50-tonnes of ice every 24hrs for the 37 bars and 20 cafes and restaurants… which will use 60,000 serviettes a day. Passengers and crew will use 2,350,000 litres of water a day that will be stored in 31 vast inboard reservoirs, and a sweet shop will stock 72 different types of confectionery. And the casino has no fewer than 450 poker machines, and 600,000 litres of paint went into decorating the ship. 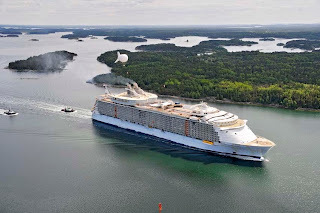 And a final note for trivia buffs – huge as she is, Oasis of the Seas has no rudders: she is powered by three stern-mounted azimuth thrusters that each contain an electric motor driving a 6m propeller, and which can be rotated during docking, a process assisted by four 7380hp bow-thrusters. Oasis of the Seas was launched last month in Finland and will sail her maiden passenger voyage from Fort Lauderdale to Haiti this week; she'll begin regular Caribbean cruises from mid-December. And it's full of life's little mysteries. The main town, Avalon has a Third Street but no First or Second Streets, the Post Office doesn't deliver the mail (but if you ask the home-delivery grocer he'll pick it up for you,) and the local cabs deliver for Avalon's pizzerias. There's a multi-million dollar 'wedding cake' art deco Casino that despite its name has never been used for gambling but only for dances, dining, movies and concerts, and the 4000 locals are outnumbered 250-1 by 1,000,000 visitors a year. Local legislation limits the number of cars and trucks on the island, and to get around this the locals drive golf buggies – of which there are more on the roads than all other kinds of motor vehicles combined. 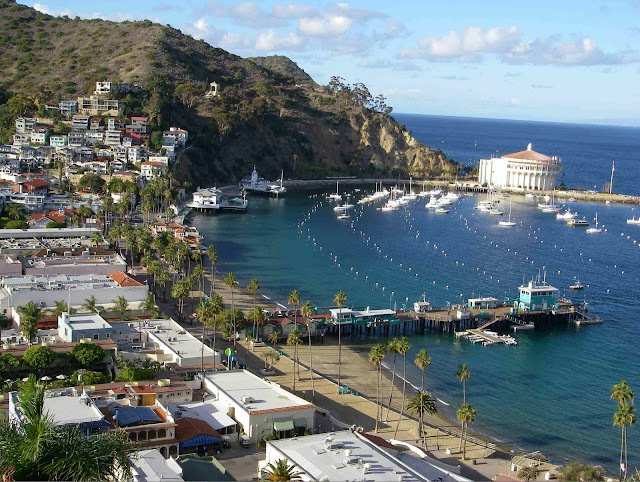 And no one knows why Catalina Island's Constitution is the only one in America that was written in pencil rather than in ink. Actress Natalie Wood drowned off the island in 1981, actor Phil Hartman was murdered there by his wife in 1988, Winston Churchill once caught a marlin off the island, and a local 1930s disc jockey went on to become one of America's most successful actors with 53 movies to his credit – and after that, President of the United States. His name was Ronald Reagan. 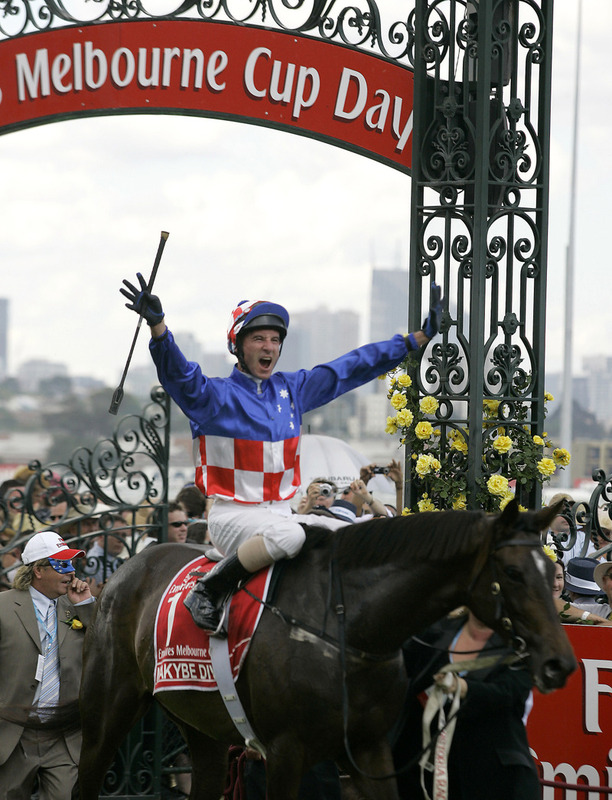 OWNERS of nags that have won the Melbourne Cup haven't always been the most appreciative types when it's come to accepting their prizes – but then they didn't get what owners do today when their steeds win the richest handicap horse race in the world. In fact when Toryboy won the Cup in 1865 his owner was so horrified with his trophy that he sold it. And in the early 1890s others growled when their 'cups' turned out to be not grand gold or silver affairs to show-off on the mantle-piece, but rather bone-china types for taking tea. And John Mayo whose horse Lord Nolan won the Cup in 1908 didn't even get a cup at all: he got a near-metre long wooden plaque atop a garish red base, and on which was mounted a silver silhouette of a galloping horse – that local wits reported looked more like a galloping greyhound. While somewhat bemused, Mr Mayo accepted his winnings in good spirit from the Governor-General – to whom he'd earlier given a tip that Lord Nolan would win the Cup – and took his horse and his trophy home to Newcastle. Another of the more unusual Melbourne Cup trophies was that won by Mentor in the Centennial Year 1888. It comprised three silver horses on a silver-plated base, the lot weighing 280 ounces (nearly 8kg) and costing around $5000. When it sold at auction in 1987 it fetched a whopping $177,000. In some years there were no trophies at all, just cash, and from 1942 to 1944 Cup winners were awarded War Bonds. The first Melbourne Cup winner's prize in 1861 was a gold watch. It was won by the owners of the great Archer which had been walked 800km from Nowra to Melbourne by a group of stable-hands, a journey that took three weeks – and the horse won again the following year, but this time got to Melbourne by steamer. The first owner to publicly criticise his Cup trophy was Mr B.C. Marshall, when his Toryboy won the 1865 race. The outspoken Melbourne draper told Victoria Racing Club officials his $200 silver bowl topped with a horse and rider was "a monstrosity," and promptly sold it to the Flemington Hunt Club which inscribed it with the names of winners of its annual Hunt until Melbourne ran out of foxes. Melbourne stockbroker W.T. Jones was the first 'tea- and coffee-cup' recipient when his horse Bravo won the Cup by a length from the formidable Carbine in 1889. As well as a purse of cash, his prize contained a set each of cups, saucers, tea and coffee pots, presumably so he could have folk around to discuss Bravo's success. 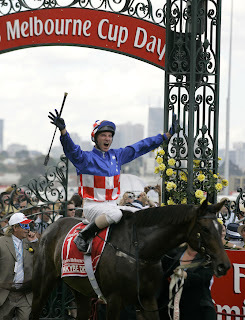 Similar packages continued to be awarded over the next few years, prompting one outraged owner to tell the Melbourne Press that such trophies were "to the proper glory of the Melbourne Cup as flat soda water is to live Champagne." The controversial prizes were replaced by more conservative trophies in the early 1900s, after Mr Mayo received that somewhat cumbersome plaque for Lord Nolan's win. Mr Mayo had never doubted his horse would win the Cup, and on a tram from his Melbourne hotel to the race track proffered such advice to anyone listening – and at the track, to Governor-General, Lord Dudley. After the race, the G-G confided how "a strange, grey-headed old man told me before the race that Lord Nelson would win; I took little notice – then to my astonishment he came up to collect his prize." By the 1920s a 'loving cup' design had been permanently adopted; today's gold cups are valued at around $190,000 each – and for good measure come with cash components for first, second and third place winners comprising a cosy $5.5m. Little wonder the race now attracts starters from England, Ireland, Japan, the USA, Germany and the UAE. HOOFNOTE: Most successful Melbourne Cup trainer, Bart Cummings has had eleven winners, while jockeys Harry White and Bobbie Lewis share riding honours with four wins each. 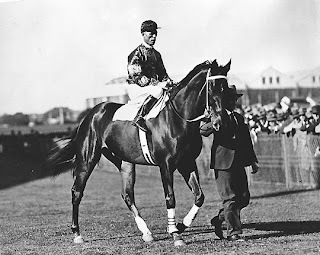 And the legendary Phar Lap that was bought for a mere $330 and earned over $100,000 in prize money, won only one Melbourne Cup from three starts – in 1930. Race-fixing criminals had tried to shoot him four days before the race, and he later died of arsenic poisoning. THE mighty Phar Lap: one only one Melbourne Cup just days after race-fixers tried to shoot him – and he later died of arsenic poisoning. IF ever there's a bloke can say he's got the sea in his veins it's a Norwegian named Valter Berg. Captain Berg is a man of the sea, by the sea. His father was a sea captain, and his father's father, too. And his father's father's father was one before that. His uncles were all sea captains and his two brothers both still are captains at sea. So it was only natural that Valter would become a sea captain. But he can boast something beyond the reach of the others: he was born on the sea. The Berg family lived on one of Norway's off-shore myriad specks of land just under the Arctic Circle, a minuscule dot that bravely called itself an island and was home to a handful of families. His father was skippering his small freighter on a run to the Middle East at the time his pregnant wife went into labour, and so Valter's uncle came to the rescue – rushing his fishing trawler to collect his sister-in-law from her island home and get her to a mainland hospital. But the young Valter was already impatient for a life at sea, and came into the world before his uncle's fishing boat – its engines running hot – reached the mainland. Today, aged 62 Captain Berg can look back at a colourful life both on the sea and under it: not only has he worked on fishing trawlers and cargo ships and passenger liners since officially going to sea at age 15, he did his compulsory Norwegian Navy service aboard a submarine. When he first began his working sea career Valter was happy to initially enjoy the trawlers on which he worked; at a remarkably young 24 years of age he was officially appointed a captain and went on to command freighters on which he expected he would happily work out the rest of his days. But one day 20-something years ago he got a call from a cruise company that had affiliations with the freighter line for which he was working: one of its small 5-star cruise ships had lost a captain to illness while visiting Sydney in far off Australia. Could Captain Berg come to the rescue and take command so the cruiser could continue its Pacific cruise? He jumped at the idea as something of a change – a change that was in fact to alter his entire life. 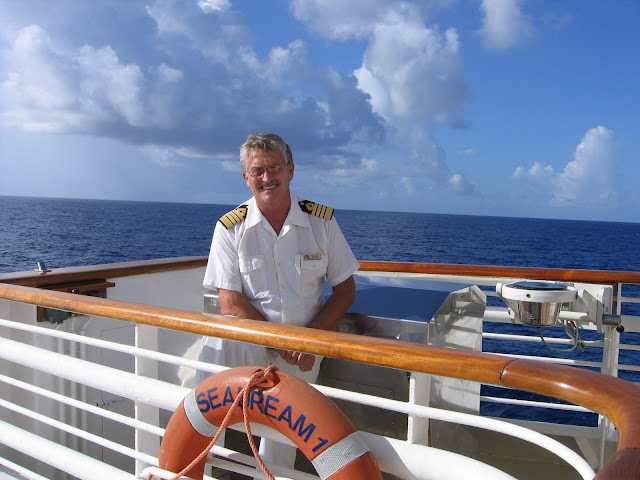 After successfully completing the Pacific cruise, Captain Berg was asked if he would be interested in joining the luxury Seabourn Cruise Lines that was owned by a fellow Norwegian, Atle Brynestad and which included in its fleet two boutique motor-yacht-cruisers, Sea Goddess I and Sea Goddess II that carried just over 100 guests each in absolute indulgence. Captain Berg knew that the small Seabourn was about to merge with the goliath Cunard Line and accepted the offer. But in 2001 Cunard decided bigger was better, and to "let go" of the diminutive two Sea Goddesses in favour of mega-liners. Brynestad horrified at the perceived-error of their ways, bought back his beloved Sea Goddess motor yachts from Cunard, relinquished his interest in the company, and founded SeaDream Yacht Club, re-naming the Sea Goddesses as SeaDream I and SeaDream II. 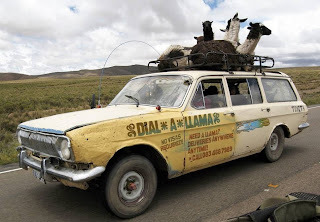 They're now the world's highest-rated boutique mega motor-cruisers, carrying just 112 guests each served by 95 crew in uber-5-star indulgence that eschews Black Tie Formal in favour of Country Club Smart Casual. But now after over two decades of SeaDreaming, Valter Berg has decided that in May of next year he'll roll up his charts on the bridge of SeaDream I for the last time. "No," he admits. "It won't be easy. I was born on the ocean, the ocean is part of me – and I am part of the ocean." But he's got a nice little flat back in Norway that he's long planned to "tinker with and finally give myself a permanent home," his son Valter Jnr is at university – and his daughter Janelle is a backstage photographer with Australian country musician Keith Urban. And after a lifetime at sea does he have any regrets? "Yes," he confesses sheepishly. "After all those lifeboat drills I ordered for ships passengers and crews, I'm glad we never had an emergency. "Because in 47 years at sea I never learned to swim." IF getting it right in real estate jargon means position, position, position, then it's a safe bet that the Hunter Valley's Holman Estate guest house is one place that's got it right. From it's broad verandah you can look across the estate's own vineyards to the corner of Broke Road and McDonalds Road, where Hunter Valley Gardens rubs shoulders with Brokenwood Wines and the futuristic Tempus Two. Or take-in the Valley's magnificent landmark, the oh-so-Australian, Brokenback Range. Yet for its seemingly busy surroundings, there's a tranquillity that appears to remove Holman from the touristy hustle and bustle normally associated with the Hunter. It's silence is interrupted only by the few vehicles that make their way to the end of Gillards Road. The house's boutique accommodation is of a quite grand scale for three couples in double bedrooms, with twin beds in another room and an option of two pull-out single beds in the billiards room if you've maybe a large family or group of friends staying for a couple of nights. Part of the Mount Eyre Vineyards, the property also includes the Three Ponds Vineyard which was established in 1999 by the Iannuzzi and Tsironis families, migrants respectively from Italy and Greece and with a naturally goodly amount of wine culture in the their blood. They have created magnificent gardens around the hilltop Holman house, which has been lavishly furnished to reflect their love of fine art. The long, painting-lined hallway leads past the bedrooms to an enormous combined lounge and dining area whose plush furnishings and huge fireplace provide the feel of a European chateau. And then, of course, there's the billiard room. The table isn't full-size but it's a good one for a few games of after-dinner billiards, snooker and pool – and best of all, there's no slot marked "insert coins here". It's easy to spend a few days relaxing in the house and doing some touring without having to leave Gillards Road: at the end of the road is the small tasting room of Constable Estate — surrounded by immaculate parklike gardens that include more than 70 varieties of camellias, separate rose and herb gardens, and an impressive sculpture garden featuring work by prominent Australian artists. The latest addition here is a larger-than-life bronze of renowned English cellist Jacqueline Du Pre. At the other end, where Gillards Road intersects with McDonalds Road, is Il Cacciatore, which for seven of the past eight years has been named the Hunter's best Italian restaurant in the Restaurant & Catering NSW Awards for Excellence. They're still trying to figure out what happened in 2006. Run by Mark and Noreen Gottaas, it's part of Hermitage Lodge, and executive chef Michael Haines has put together a scintillating menu of Italian-inspired delights, including his speciality of pan-fried gnocchi with local chorizo, roast pumpkin, wild rocket and basil pesto. And after lunching here on a Saturday or Sunday you can always do a tasting at Scarborough as you toddle the few minutes back to the house. Tariffs at Holman Estate range from $1350 to $1800 for two nights for eight adults, and the bonus is that with the vast living and entertainment space you don't feel like you're living out of a suitcase in a motel room. 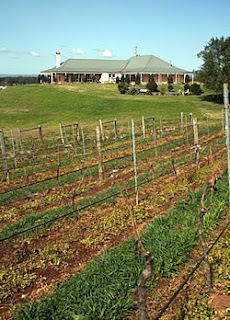 For further information: Holman Estate — visit www.mounteyre.com or phone 0438 683 973. People want a holiday experience they can talk about at a dinner party rather than just another gadget – and tourism marketers need to make the most of this, a researcher from The University of Queensland says. UQ School of Tourism senior research fellow Dr Noel Scott says many people have all the gadgets and designer clothes they need, so they start hunting around for unique tourist destinations and experiences. The tourist destinations need to provide these people with an experience they cannot get anywhere else, Dr Scott said. The comments come as Dr Scott prepares to release a book he edited with fellow researchers Eric Laws and Philipp Boksberger called Marketing of Tourism Experiences. The book covers things such as wine tourism, visits to museums and national parks, design of urban precincts with tourism in mind and inter-cultural experiences. Dr Scott said it aimed to help tourism marketers appreciate how important it was to sell their destinations as places where people could experience exciting new things. "Wine tourism is an example of a type of experiential tourism because you get to taste it,'" he said. "Up till now, people in marketing or in business have generally been selling products, like buying a bag of sugar. There is not much of an experience in buying a bag of sugar. "Today people have so much money and they live in a consumer world. People are interested in brands, not just products. "It is not just the physical product but the whole idea of the product they are buying. "If you buy a Gucci handbag, you are not just buying a handbag. You are buying a name and a status. When you have all the brands you need, people buy experiences. These are unique.'" It was the same in tourism, Dr Scott said. "An experience is something you talk about afterwards at a dinner table and people are interested," he said. "You don't talk about your hotel room or travelling by plane. An experience is emotional. It is delightful. "You need to sell your tourism product or destination as an experience. You can stay at the Tarzan room at a particular hotel. You are not selling a room. It is an experience.'" Some Hollywood hotels had rooms related to specific films, Dr Scott said. Members in some Chinese tour groups are asked to take roles in a simulated wedding, alongside actors dressed in traditional clothing, he said. Tourism marketing worked best when it evoked the senses and emotions and may involve providing traditional food, trinkets infused with smells or music associated with the destination, Dr Scott said. "A physical experience can lead to an association with a destination." Dr Scott's book is available for $134. Visit www.routledge.com. A new parliamentary report says regional tourism needs extra support in the wake of the global financial crisis. The House of Representatives report released today has investigated the impact of the world economic downturn on regional Australia. A total of 170 submissions were received from welfare agencies, small business, the National Farmers Federation and councils including Griffith, Urana, Tamworth, Gunnedah and Moree Plains. Most cited a big fall in income, losses on investments and difficult trading circumstances. The committee chairwoman, Catherine King, says it is clear additional support is needed in some areas. "So we've made some recommendations around certainly some capacity building in local communities, better coordination of federal government services so that people at the local level can actually take advantage of programs as they come up," she said. "We've also obviously called for the extension of some Federal Government programs in which there's funding, particularly in the tourism portfolio." Ms King says the financial crisis has hurt regional communities reliant on income from overseas visitors. She says regions that support only a couple of industry sectors are also struggling to bounce back. "If they were not sufficiently diverse they had been knocked about quite a bit by the global financial crisis and we do know that nationally unemployment figures are continuing to rise," she said. "In regional communities it's been exacerbated where there is just one large employer, but in others it's just been a slow bleeding of jobs in smaller communities as well." Cruise Weekly: Ready ... on your Marquesas ... go! If there ever was a perfect outpost as sanctuary for troubled artists, refuge for wayward seamen and magnet for restless adventurers, then the far flung islands of the Marquesas would have to be it. Sure, you can catch one of the easy flights from Tahiti and bum around, but for an authentic arrival, come as Cook, Porter and Melville did; aboard ship. Unless your name is Packer, whose private ship is moored in Tahiti as you read this, you could not conduct a more thorough exploration of this dramatic, geologically youthful archipelago than with the Compagnie Polynesienne de Transport Maritime (CPTM) sailing year round with Aranui 3. For the trivia-minded, this the location favoured by the disturbed French master, Paul Gauguin, and publicity-exhausted Belgian pop idol, Jacques Brel. Both, despite contrasting, if short, relations with the locals, also chose to be buried here. As with all true adventure cruises, this is a voyage of discovery and learning. Each island port reveals a little more of this fascinating culture and its catastrophic demise. Although modern Marquesans enjoy comforts provided by their French colonial overlords, the 8000 'survivors' are the tail end of a prominent civilisation that numbered around 100,000 until the beginning of the 19th Century. Although freedom to practice (most) ancient arts and customs is restored, white man has a lot to answer for in the Marquesas. The Aranui 3 is the CPTM's fifth vessel to ply this route, an exclusive freight/passenger operation that has grown from humble beginnings over 50 years. This newest vessel was built to a German design in Romania in 2003 and flies the French flag. GRT is 7000 tons and passenger capacity is 198 across four grades from fancy suites (14) with balcony, nine deluxe staterooms, 63 standard cabins and 18 berths in three dormitory-style rooms. Expect to spend your time mingling with worldly folks from all over. Our near-capacity complement consists of mainly Germans and French, with a scattering of Americans, Canadians, Brits and sundry EU countries. We are bankers and academics, builders and cab-drivers, flashpackers and corporate refugees. Average age is around 60, but under 50s should also be encouraged. It's a great opportunity to exercise your second language and swap tall tales with seasoned travellers. Friends are made easily in this eclectic human trail mix. With any cruise like this you need personal versatility. The schedule will almost certainly be interrupted or altered en route due to the primary function of freight delivery. Difficult cargo and sea conditions will dictate time in port and shore activities offered. There's no point bleating “... but the brochure says ...!” because it warns you that [stuff] will happen and it does. You're in Polynesia and all that 'island time' means, but it's also extraordinarily remote and challenging. In my mind, none of this is sufficient reason not to go because the Marquesas are definitely one of the few remaining corners of the world worth every effort. NZ National Institute of Water and Atmospheric Research oceanographer Mike Williams said four icebergs up to 250m in length had been spotted by fishermen about 80km northwest of the Auckland Islands, 400 to 500km off the coast of New Zealand. The mass of icebergs was first spotted about two weeks ago by Australian Antarctic Division researchers working on Macquarie Island. Satellite imagery showed the icebergs, were now tracking northeast towards the South Island at about 1 to 2km an hour, Mr Williams said. Rodney Russ (pic left) expedition leader on the polar tourist ship “Spirit of Enderby” and an expert on Sub Antarctic New Zealand said this is the first time in almost 40 years of visiting this area that he has seen icebergs so far north. "They currently appear to be moving north at about 1.25 kilometers per hour. It is possible that they might reach New Zealand intact - but they are showing signs of deteriorating and breaking up," he said. "We first sighted them 10 miles off the eastern entrance to Carnley Harbour in the Auckland Islands. Weather and sea conditions at the time prevented a closer inspection but as conditions improved today and we were able to locate them and sail close by”. "They had traveled 19 nautical miles to the north and they currently lie six miles east of Port Ross at 50 38'S, 166 25'E," he said. The "Spirit of Enderby" left the Auckland Islands on Wednesday (November 18) bound for Macquarie Island and fully expects to encounter more icebergs as they were seen by researchers, based on Macquarie Island, last week. "The crew of the vessel has been put on special 'iceberg lookout' as these icebergs pose a significant risk to shipping. We have never had 'iceberg alerts' in the Sub Antarctic islands before. 'Iceberg lookouts' are a feature of our Antarctic voyages but have not been deemed necessary on a Sub Antarctic Expedition, but maybe that will have to change," he said. Heritage Expeditions is a New Zealand award winning expedition travel company, which specializes in worldwide natural history small group expeditions for the discerning traveler to areas such as the Ross Sea, Antarctica, the Sub Antarctic Islands, subtropical Kermadec Islands, Pacific Odyssey and the Russian Far East.